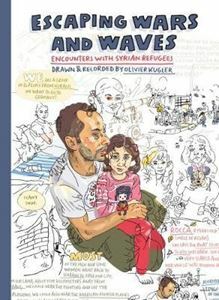 Collected here for the first time, Olivier Kugler's series of brilliant drawings of refugees from Syria in Escaping Wars and Waves document the lives of individuals and families in Iraqi Kurdistan, the tourist island of Kos, and the Jungle at Calais. Olivier Kugler's series of brilliant drawings of refugees from Syria establishes this award-winning artist as one of the most important graphic reporters of our day. Collected here for the first time, the drawings in Escaping Wars and Waves document the lives of individuals and families Kugler met in Iraqi Kurdistan, the tourist island of Kos, and the jungle camp at Calais, mostly on commission for Medecins Sans Frontieres. As well as his work with Medecins Sans Frontieres, Kugler recorded the experiences of refugees in London, Birmingham and Simmozheim, the small village in Germany where he grew up. The stories he tells are often tragic but also uplifting, testimony to both human senselessness and resilience. Based on many interviews, thousands of reference photos, and an acute observation of the objects, locations and conversations making up our daily lives, the effects of what he records will be felt for decades to come.